How do interior designers differentiate between the words “modern” and “contemporary” – are they interchangeable? The word “modern” as a style concept means timeless and iconic, forward thinking and innovative. Interior designers state that the word “modern” is one of the most misused phrases in decorating. This is because it is often confused with the word “contemporary”, as in contemporary style. Modern means it doesn’t change, it is a defined style, and will remain such forever. Today’s modern style is actually based on a design movement that originated at the turn of the 20th century. The modern-style movement continued to grow in popularity and later became known as mid-century modern and post-modern style. The modern-inspired style has its roots in German and Scandinavian architecture and design. It is simple and unadorned and often celebrates back-to-nature concepts such as natural materials, neutral or earthy colors, and simple lines and unfettered detailing. Also, it is a design borne of minimalism. The minimalist concept is perfect for apartment dwellers or homes with small rooms, because it maximizes space, thus creating the impression that a room is larger than it actually is. You might further identify modern-style interior design as minimal textures and bold geometric forms, polished finishes and asymmetrical balance. The basic philosophy behind modern-inspired interior design is that it caters to those who dislike clutter and fussy adornments and favor instead uncluttered spaces and clean lines. Structural elements, like concrete or beams, often left exposed since the modern-style design emphasizes horizontal and vertical lines. This concept continues as to furnishings as well – modern design favors low, horizontal furnishings, with a clean line. Natural light and plain, unadorned windows are favored. Natural materials and textures like unpainted wood, metals, leather and natural fibers like linen, natural woods and wood veneers are part of this concept. 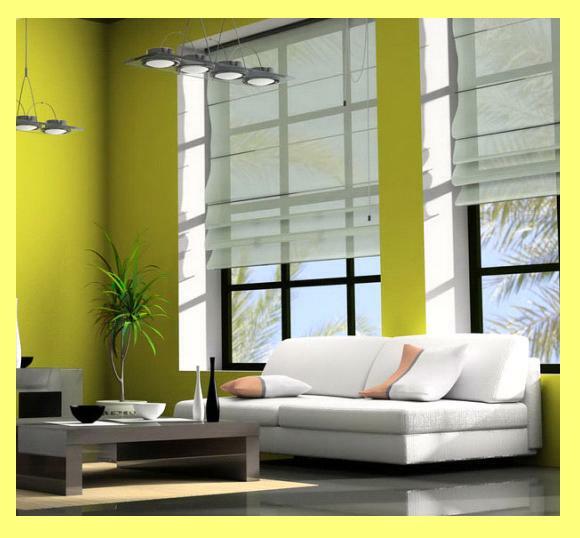 The color palette also is natural – light colors or virtually neutral shades. The lighter shades add to the expansive feeling. Any dashes of color are strictly used in moderation. Reflective surfaces, i.e. steel, chrome or glass are popular. Furniture is open and raised off the floor which creates an airy feeling. Add a huge vase with faux flowers in eye-catching colors. Add a mural or large piece of unframed, canvas artwork awash in a variety of colors. Add accessories in vibrant colors to add pizzazz to any room. Add a simple, bright-hued pillow which will punch up any room just as a colorful rug will in the living room. Add a brightly colored metal stool in the kitchen allowing a wee touch of whimsy to an otherwise strictly chrome and stainless steel area. Add a little pizzazz from far-off lands to give interest and intrigue to a staid and blah room – try using ethnic fabrics, upholstery and prints. They will make your room come alive. Add some inexpensive and natural-looking fiber-art and macramé, a form of artwork that was popular in the 70s and now is seeing a resurgence, to shake away the blah walls and replace it with a creative and arty touch. Add metallic touches as shiny rules in these types of accessories that put some glitz and glamour into a room without being too overdone. Add wood tones that are lighter, like a honey-toned stain that can help accomplish the modern-style theme. That switch to lighter wood is a trend that has been growing for approximately five years now. If you want to create a modern-style home without completely re-furnishing from scratch, the easiest and least-expensive way, save removing half of your existing furniture and accessories, is to redo your wall colors. Blue is big and in a myriad of different shades of this perennial favorite paint color. But the blue will be picked by you as your personal favorite and will add a splash to your staid neutral walls – think of rolling different shades of blue, one-by-one like dominos, to create a wave of sorts. Black and white is a cool concept for the modern home, but not the stark bright white and glossy black, but instead a softer tone of each of those colors, which takes the edge off the contrast. It is a timeless color combo to be sure. You don’t have to create a rainbow in your house to infuse a little vitality into a tired room or rooms, just enough color to add a little pizzazz.